Least Likely Daddy: Whale watching! 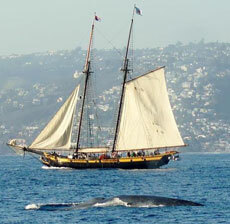 A close encounter with a mighty Blue Whale! 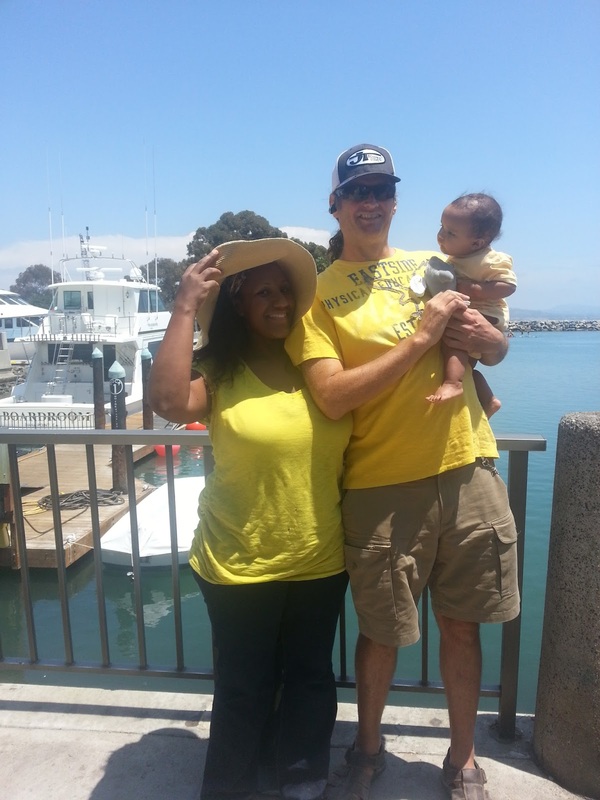 The family at Dana Wharf. There is plenty to do down there. Our darling baby “bean” is now almost 10 months old. She just got her first tooth, took her first steps in our swimming pool and has her own distinctive crawling style! Recently the in-laws were in town, visiting from Texas. I wanted them to experience something that is distinctly Southern Californian, and that they couldn’t do in Dallas Texas. But what to do? Whale watching! Plus it is something I have always wanted to do my whole life. 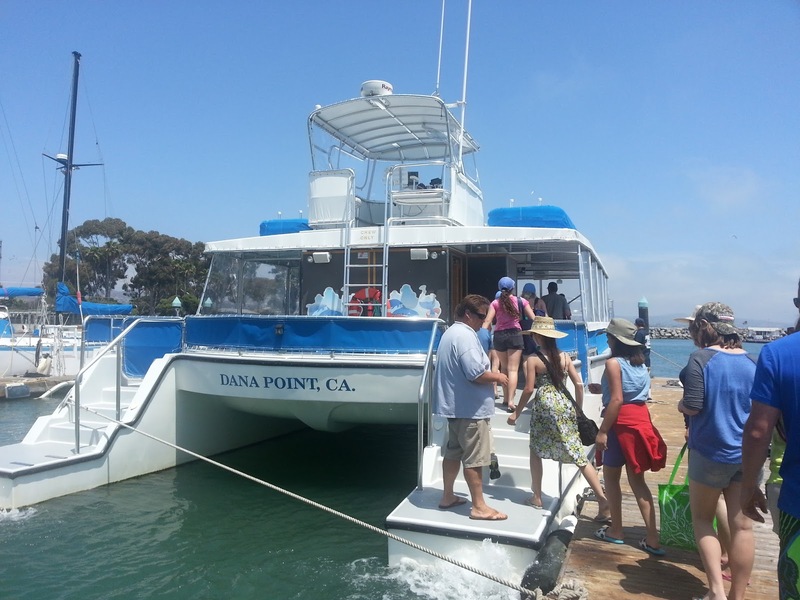 We called the extremely helpful Kelly at Dana Wharf Whale watching and Sportfishing on (949) 496-5794 and set up our trip. Give Kelly and the crew a call. We arrived at Dana Wharf and found Kelly and other polite staff inside the shop front located at 34675 Golden Lantern, Dana Point California. We were informed that they had seen over 40 whales that week, and today there was a big beautiful blue whale just off the coast. 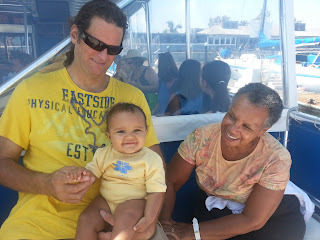 We boarded the boat which is wheel chair accessible and we were able to bring our fully loaded stroller along. It was a much larger boat than I imagined and was impeccably clean with a stocked bar that served adult beverages along with the child friendly versions, a snack shop and finger foods. We found comfortable seats for all in our party as we left the dock and cruised out of the harbor. Getting on the boat is easy and they have wheel chair accessibility. As we left the safety of the harbor and headed to the open ocean I felt the desire to stand on the front deck and feel the cool ocean breeze on my face. I strapped the baby “bean” into our JJ Cole medley baby carrier and headed to the bow. We were both happy with the wind in our faces and scanning the horizon for a whale. We saw a seal, while the tour guide explained to those around about the whales, how they are able to track them, the different whales they had seen lately, their behavior and how they feed. My wife came and joined us at the front of the vessel, saying the “bean” was looking a little “green”. I suggested that my daughter was fine and that she was the one who was turning “green”. We put a warm sweater on the “bean”, which is something I recommend everyone bring as the coastal temperatures are lower and the wind providing additional cooling effect. My mother in law Carol, the baby "bean" and myself on the boat. After a relaxing boat ride we were in the general location of the whale. 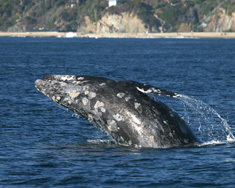 Apparently whales surface every 8 – 15 mins while feeding, however they can stay down much longer if required. When they surface the whales take around 4 – 5 breaths, in which they come up take a breath, then dive briefly and surface again. When they are about to dive they take a bigger breath, rise out of the water more and when they dive the tail rises out of the water. Here are a couple of "stock" pictures as it appears everyone's phone camera or phone was out of action that day. The whale we viewed was around 100 feet long and seeing it surface was a magical moment and I was amazed how close we could get to the whale. It is a magnificent creature that is massive and graceful at the same time. 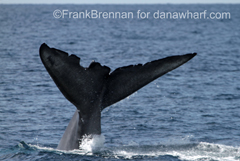 I couldn’t believe the feeling that just seeing a whale evoked. 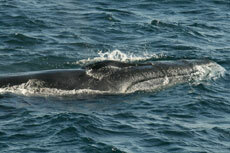 I recommend that everyone try to make a point of going and seeing a whale in the wild, it is an amazing experience. Something you should do at least once in a lifetime. After the whale surfaced and then dived it is just a waiting and floating game waiting for the whale to surface again. My wife, who was a nice shade of green came up to try and rescue my daughter apparently from having the time of her life. It seems my mother-in-law, who I actually like, thought that was unsafe for my daughter, her only granddaughter, to be near the front of the boat as the whale may jump onto the front of the boat and we would all end up in the ocean! My wife only told me this after we returned to the dock, as she made up a story about the “bean” being hungry. There are a couple of disturbing points here: a) whales have never jumped onto boats b) my mother-in-law only had safety concerns for my daughter and not me! Also IF a whale jumped onto the front of the boat I think everyone on the boat would be in trouble. This is a shot we got that day before the battery died! Smart phones indeed! Over the course of the cruise we saw the whale surface 4 or 5 times, each was time was a magical moment. One time the whale popped up 10 – 20 feet from our boat. Maybe he was doing some people watching! 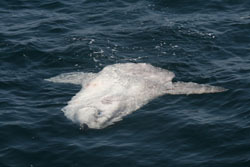 You never know what you will see on a tour, here is a rare sun fish. 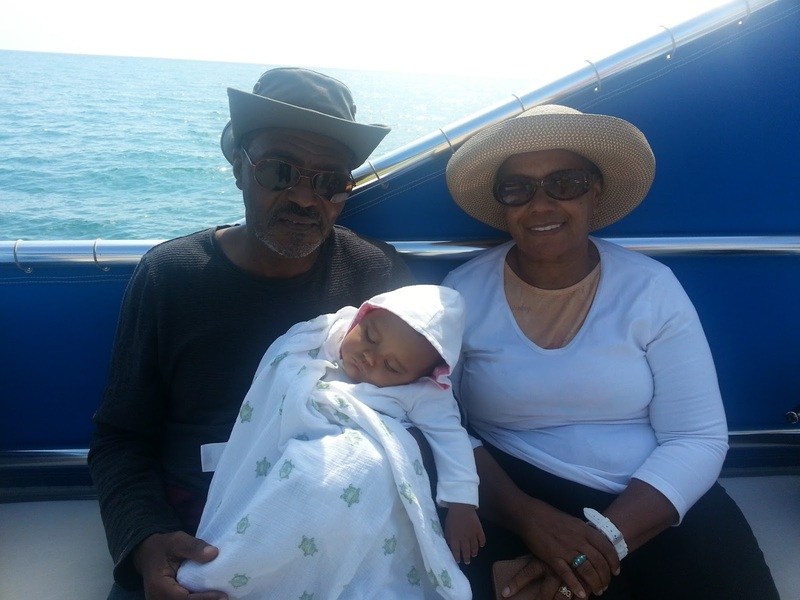 All the excitement tried out the little baby "bean" here she sleeps with her proud grand parents. It was a magical afternoon and a memory that will last for the rest of my life. I am so glad I had the opportunity to experience it with my daughter, wife and in laws. I would like to thank the staff and crew at Dana Wharf Whale Watching tours for an amazing day. Check out my wife's perspective of our child raising events at Diary of a Pregnant Comedian. When do you let the World know you are pregnant? I am a new father. I have worked in a wide variety of roles from General Manager, Business owner, Research and Development and even in the media as an actor, writer and I have also had my own program on the radio. I have traveled the world living and working in Australia, Europe and currently the US. I am bi-coastal and can be pretty much found anywhere in between. Also I can be found riding, racing or even tinkering on my motorcycles. Fatherhood is my most challenging and rewarding role to date. However being married to a comedian helps. So I hope you join me on our adventure as a family as it is full of fun, laugher and sometimes it is even educational.